Each drop of bulls is subjected to a series of measurements and drafts before being offered for sale, generally from February onwards. At this time the bulls are aged from 16 months and obviously mature as the year goes on. 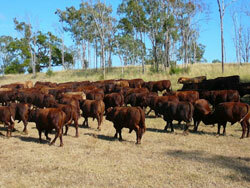 All bulls are grown out on pasture and/or fodder crops. As a result the growth and body condition of the bulls can vary from season to season because feed availability is very much dependent on rainfall. 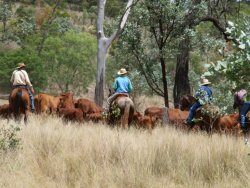 While we could grain feed to make the bulls ‘look good’ at all times we are mindful of the fact that the bulls we sell have to work on pasture in the herds they go into and believe in setting them up for long, productive working lives. Selection early in the year offers prospective purchasers the ‘pick’ of the whole drop. Because of their pasture preparation the bulls at this point are usually not grown enough to serve mature cows, however they will handle a mating with heifers. Bulls selected from August onwards can remain at Rosevale until the annual sale which is held in late September. Buyers of such bulls will have the option of purchasing bulls at the annual sale with the selected Private Sale bulls acting as a back-up. For example, if a buyer selects ten bulls in August and later purchases four bulls at the Annual Sale then he/she is entitled to leave behind four of the bulls selected earlier at no expense. This option gives buyers the confidence to come to the Rosevale Sale and walk away with the number of quality bulls they require within their budgets. Priced @ $3,000 + GST. Inspections welcome at any time.